Program helps high school students gain a better understanding of money matters. In an eighth-period Wealth Management class at Tigard High School, students listened attentively to speakers from Black Rock who came to share business insight. The guests — Cory Burket and Jazmine Crowe from corporate and barista Madison Macy — offered students valuable insight into what working for and with a small business is like. 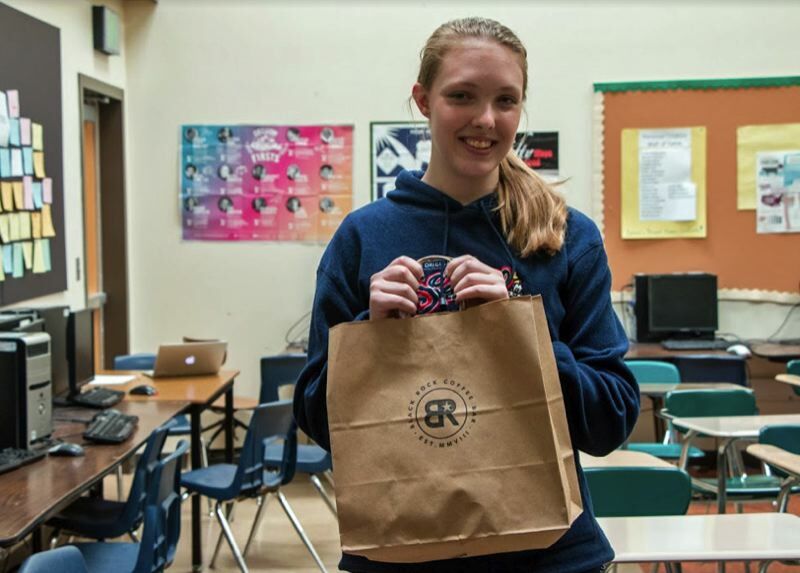 The team was presenting a prize package to the class's H&R Block Budget Challenge winner and had been doing so in each class throughout the day. Black Rock donated a package of gift cards and merchandise to the winner, plus free drink cards for the whole class. The H&R Block Budget Challenge is a 10-week program to help teach teens money management skills. The challenge simulates real life, giving kids paychecks, teaching them how to pay bills, plan for a 401(k), and make financial decisions based on what they might encounter in real life. Students participating have the chance to win scholarships and other prizes. The goal of the program is to help students gain the necessary financial skills to be successful in the future. Participants in the program also have the chance to test their skills against other classrooms nationally. At Tigard High, through business teacher Sue Suttich´s Wealth Management class, students have the opportunity to participate in the challenge. Suttich has been offering the chance for four years. She began to offer the challenge because it puts into practice specifically what they go over in class; things like how to budget, the importance of paying bills, what a 401k is, and the importance of an emergency fund. Suttich said she believes students interest in preparing for the real world draws them to the class. "I think that they're curious about what it's like to deal with their own money and I make it a competitive process for them," Suttich said. "There's an atmosphere of 'oh, I'm going to be better at life then you,' and bragging rights at stake." Suttich encourages students to take wealth management because the class gives students a chance to talk money. She believes it's the one class that is "because students know this is information they will be using throughout their lives. "Black Rock has been (a big part) of motivating students," Suttich added. "It's really great that they support students and schools through stuff like this." Eighth-block winner Teija Atkinson said she began taking finance classes because she thought it was important to start learning about money and everything that comes with it. "I won't always have my parents with me to tell me what to do," she added with a laugh. Atkinson believes that she won because she took the challenge more seriously then her peers, and paid attention. "I paid attention and took time to care about this because I knew that this is how real life is going to be, and I don't want to be underprepared," Atkinson said. While participating in the challenge, Atkinson said she learned basic stuff, but the most important thing she learned was to take responsibility with her finances and the responsibility that came with earning income. Her key to success? "Setting goals and figuring out the steps I need to achieve them," Atkinson added. Even though Suttich's students weren't earning real money, they were earning experience. As the book "The Millionaire Next Door" states, "Wealth is more often the result of a lifestyle of hard work, perseverance, planning, and, most of all, self-discipline." Article written by Tigard High School sophomore Meghan Turley.